Canada has managed the 2nd draw of Express Entry in a week and 3rd Draw in the January month, highlighting the lowest minimum score of Comprehensive Ranking System for an all-program Express Entry draw since Sept 2017. The Jan 30 draw noticed Invitations to Apply announced to 3,350 applicants with the least score of CRS 438 points. Immigration, Refugees and Citizenship Canada have presently announced 11,150 ITAs in the month of Jan, the greatest on record for the opening month of the year. The early Jan record was about 9,744 ITAs, fixed in the year 2017. Canada has an immigration intake of the high-skilled professionals' target of 81,400 for the year 2019, after smashing the record for yearly Express Entry ITAs in the year 2018 with 89,800. 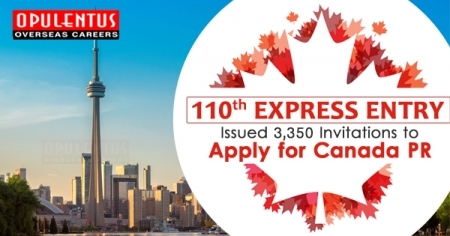 It was the 03rd round of invitations below Express Entry in the year 2019 and 110th overall. The Express Entry system is immigration path implemented by the immigration authorities of Canada (I.R.C.C) on Jan 1, 2015, which controls skilled worker appeals below the programs of Federal Economic. It includes the Federal Skilled Trades Program, the Federal Skilled Worker Program, the Canada Experience Class and multiple Provincial Nomination Programs parts. Stakeholders assume to see around 30 draws and higher than 80,000 invitations announced in the year 2019, with majority draws highlighting C.R.S scores beneath 450 to allow Canadian immigration officials to achieve targeted yearly levels of immigration for the year 2019. It is assumed that the plenty of applicants to be announced ITAs in the year 2019 will need a score of CRS well below 450 points, allowing a significant number of candidates to obtain Canada PR without a job offer or nomination below the program of provincial nomination. However, securing an authorized offer of employment is deeply recommended.